Psyllium fiber is extracted from the Plantago ovata plant’s seed and is beneficial for the heart and the pancreas. It is a laxative that can soak water from the gut and improve bowel movements. Psyllium fiber supplement is highly beneficial for people who have digestive and heart-related problems. 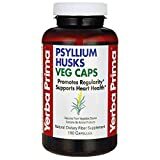 Psyllium husk can be taken either in husk form or as capsules. The form you choose will depend on your personal preference and both deliver similar results. Listed below are some of the best psyllium fiber supplements that can be used to improve overall body health. The first product on the best psyllium fiber supplements list is Viva Naturals’ Psyllium Husk Powder. Each teaspoon contains 4g of dietary fiber and creates a gel when added to liquids. This product provides 16% of the daily fiber intake required by the body. The psyllium powder included helps aid in digestive problems and also improves cholesterol levels. This product can also help you fight food cravings as it makes you feel fuller when taken with water. It is a suitable supplement for all diets and is GMO-free. It contains certified organic ingredients that fulfill daily body requirements. Customers who have used this psyllium fiber supplement have praised it as it has assisted in weight loss and reduced obesity-related issues. With that, they also noted improvements in overall health through improved digestion. 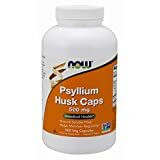 The next product on the best psyllium fiber supplements list is Psyllium Husk Caps by Now. This product comes in packaging that includes 200 and 500 capsules. This psyllium supplement is suitable for intestinal health and helps maintain regularity. It is a natural soluble fiber that is GMO-free and has been approved by GMP. The product doesn’t contain gluten, soymilk, yeast, eggs or fish. The psyllium powder helps meet the daily intake of fiber required. Customers who have used the psyllium fiber pills have talked about its effectiveness and have stated that most have never had a bad experience after using this product. Organic Whole Husk by Organic India is the next featured product on the best psyllium fiber supplement list. The product has been created with the aim of providing body relief and detoxifying intestines. It also cleans the colon and aids in regularity. It is a product suitable for weight loss and maintenance of body weight. This psyllium fiber supplement keeps the heart healthy and lowers blood pressure and cholesterol levels. If you have constipation issues, this product is for you as it helps improve digestion. It contains certified organic ingredients and is GMO-free. Customers who have used the product have found it to be effective and have talked about the improvement in their digestion. Natural Psyllium Fiber by Kirkland Signature adds on to the list of the best psyllium fiber supplements. This product is made with 100% natural husk fiber and is available in orange flavor. It is a complete source of fiber that provides nutritional requirements needed by the body. The product contains 180 teaspoon doses and is sugar-free. The natural ingredients present in the product are what make it among the top selling psyllium fiber on the market. Customers who have used the product have found it effective in dealing with digestive concerns, lowering cholesterol levels and dealing with diarrhea problems. It is a great fiber supplement that can improve overall body health. 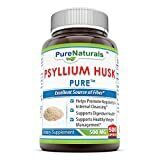 Psyllium Husk by Pure Naturals is also part of the best psyllium supplements list. This product is an excellent source of soluble fiber and supports digestive health. Also, it is perfect for removing toxins and waste from the digestive system. The product also makes bowel movements easier by helping in regularity and absorbing water in the colon. The same also supports healthy weight management and improves overall body health. There are no artificial flavors or sweeteners used to make this psyllium fiber pill. Customers who have used this supplement have found it especially useful for digestive purposes. Psyllium Husk by NutritOnNN is another product on the best psyllium fiber supplement list. This product contains 240 capsules and is a great source of soluble fiber. It contains and helps support regularity and also aids in weight loss. All those with heart conditions can use this product to improve their cardiovascular system. The psyllium fiber pill contains fiber that is necessary for the body and helps with the digestive system. Customers who have used the product stated that it helped with constipation issues and showed results within days. It is also suitable for dealing with fissures and hemorrhoids. This product by Luroot containing 240 capsules of 725mg is among the best psyllium fiber supplements on the list. It helps promote regularity and deals with bloating and constipation issues. The product contains soluble fiber that can absorb water from the gut in order to soften bowel movements. The supplement also supports a healthy heart system by maintaining cholesterol levels and reduces the risk of heart disease. The same also helps keep the good bacteria active in your gut in order to keep the immune system healthy. It gets rid of discomfort and provides the body with the relief required. Customers who have used the psyllium fiber pills have talked about how the product was effective in dealing with constipation issues and results could be seen within a days’ time. This product by Yerba Prima ranks among the best psyllium supplements. The product contains 180 capsules that are made using vegetarian friendly ingredients. The product is economical and doesn’t contain any animal product. It aids in promoting regularity and improving overall health. The fiber in the material helps the body improve digestion and fight constipation issues. The fiber included also meets the daily requirement that the body needs. It is one of the best fiber pills in the market as stated by customers who have used the product and found it the best remedy for IBS issues. This product by Solgar is also part of the best psyllium supplements that help deal with digestive problems and help in bowel movements. The product consists of psyllium husks which provide relief and help with absorption. Manufacturers instruct using this product with water to prevent the hazard of choking. It is not recommended for individuals who have problems swallowing. Customers who have reviewed the psyllium fiber pills by Solgar have found it to be effective in curing bloating and constipation. 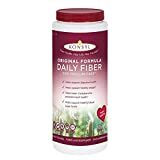 The final product on the best Psyllium Fiber supplements is Original Formula Daily Fiber by Konsyl Pharmaceuticals. The product is made with 100% natural ingredients and contains pure psyllium. There is no sugar or gluten added to the product and it is effective in keeping the heart healthy. Each dose contains 6g of psyllium fiber. The fiber included helps improve digestion issues and provides the necessary nutrients required by the body which in other cases are neglected. People who have used this product have found it very useful and have stated that the results can be seen within a weeks’ time. The product helps lower cholesterol levels and also helps in the management of diabetes. These are some of the top psyllium fiber supplements that can be used to improve body health and speed up the digestive process. For best results use as instructed by the doctor. The supplements provide relief and are focused mainly on improving bowel movement.